Climate change has been on the radar for years now (we have documentaries such as Al Gore’s “An Inconvenient Truth” to thank for that), yet there is a crucial element of this problem that remains largely ignored. Over the past few decades there has been a rapid increase in the level of greenhouse gas emissions released into the atmosphere through human activities, which has led to global warming. The effect that global warming has on weather conditions around the world is known as climate change. Unnatural, long-term changes in climate conditions around the world can result in several things including loss of natural resources, wildlife extinction, ecosystem damage and extreme weather events (such as floods). In developed countries, many don’t see climate change as a pressing concern for the time being; meanwhile, communities around the world are gathering their belongings and leaving their homes because of the effects that climate change has had on their environment. These people are known as climate refugees. What Regions are Most at Risk? Many of the communities at risk of extreme impacts from climate change are in poorer, developing countries. 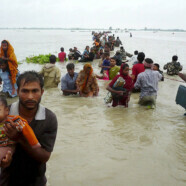 It is likely that most refugees escaping from extreme weather events and sea-level rise will be from Africa and Asia. Asia is at high risk of extreme weather events and sea-level rise, but will also be severely affected by drought. Africa is especially vulnerable to drought and water scarcity, but many regions are also at high risk of sea-level rise. Latin America is particularly at risk of water stress and drought. Many small islands will be highly affected by even a moderate sea-level rise. It does not help that a large number of the nations at risk already face serious issues such as high population densities, political instability, famine and a low level of per capita income. With so many other problems to consider, it isn’t surprising that there is not enough priority given to solving the climate refugee problem which, relatively speaking, is not affecting entire nations at large just yet. Also, because of financial constraints, many of these countries lack the resources (for example: proper infrastructure, community preparedness and compensation) to appropriately accommodate and prevent victims of climate change from having to migrate. The irony with climate refugees rests in the fact that those being forced to leave their homes and land have played close to no role in increasing the rate of climate change. The level of greenhouse gases emitted by these developing countries is close to nothing in comparison to developed countries. So while industrialized nations continue to pump out pollutants by the ton and enjoy the luxury that is ignorant bliss, the effects are felt millions of miles away on villagers in self-sustaining communities, where people are forced to pay the price for the mistakes of developed countries. Currently, climate refugees are not protected or even recognized by international bodies such as the United Nations. Climate refugees should be recognized under international law as refugees and be given the same rights as refugees fleeing conflict from their country of origin. Developed countries can contribute by donating money that can be allocated for programming against climate change impacts in developing countries. Such programming will aid in preventative measures for communities, so that having to re-locate against climate change impacts is not the only option for them. Lastly, general public awareness around the world will motivate local and national governments to prioritize climate change and recognize it as a serious issue. Environmental Justice Foundation, 2011: http://www.ejfoundation.org/page563.html . Environmental Justice Foundation, 2011: http://www.ejfoundation.org/page578.html . Biermann, F. and Ingrid Boas. 2010. “Preparing for a Warmer World: Towards a Global Governance System to Protect Climate Refugees”. Global Environmental Politics 10 (1): 72. Biermann, F. and Ingrid Boas. 2010. “Preparing for a Warmer World: Towards a Global Governance System to Protect Climate Refugees”. Global Environmental Politics 10 (1): 69.